In the early 1990s, AIDS activists across the world took to the streets to persuade their governments to recognize their increasingly dire plight. The most famous of these groups was arguably Act Up, which began in New York City and spread across the world, including in Paris, France, the focus of Robin Campillo's new film, BPM (Beats Per Minute). Act Up's tactics were controversial, but their message was urgent. Known for invading pharmaceutical company offices and throwing fake blood on politicians, Act Up was willing to do whatever it took to make sure they were heard. BPM gives us an inside look at the decision-making that drove the group in those formative years, fighting against injustice and ignorance as their friends and family were dying around them. Our guides into this world are Sean (Nahuel Pérez Biscayart) and Nathan (Arnaud Valois), a young couple who meet at a protest and fall madly in love. Sean is HIV positive, Nathan is HIV negative, something that simultaneously brings them closer together, and pulls them apart. But as Sean's situation becomes increasingly dire, he finds himself becoming more and more radicalized, pushing the organization to ever more extreme forms of protest. But despite the growing unrest within the organization, and the pushback from politicians and the public alike, the fact remains that they are fighting for their lives, and have no time to play nice. It's a noble and important subject matter, memorably highlighting the seriousness of their situation and their desperation to find a cure, in spite of public ignorance and political indifference. The problem is that, at two and a half hours, the film runs too long, and spends far too much time observing Act Up's meetings than their actual protests. The internal politics of the group are undeniably fascinating, but for a film about a group of young radicals, it's awfully talky. The meeting scenes begin to drag down the narrative momentum, even as fine performances by Biscayart and Valois give the film its heart. 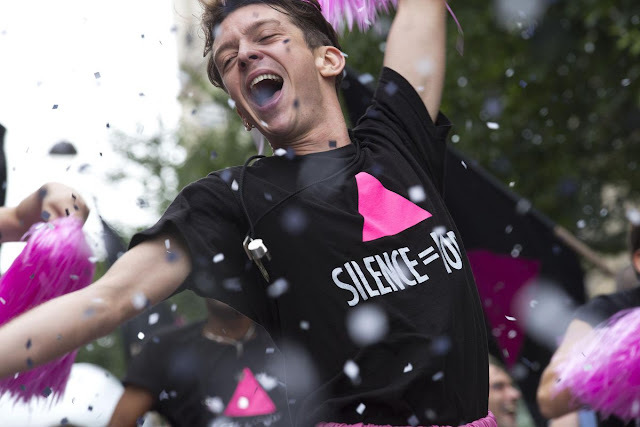 The relationship between Sean and Nathan is easily the highlight of the film, shining a light on the human toll of the AIDS epidemic, and the deeply personal reasons behind Act Up's brazen tactics. It feels wholly authentic, and by the time the film reaches its inevitable end, we've become deeply invested in these characters. Act Up remains controversial even to this day, yet BPM humanizes their efforts by framing it as a literal life-or-death situation. It gives the story an urgency that the film often doesn't take advantage of, bogging it down in the makeshift parliamentary procedure of their meetings. The result is a film that moves in fits and starts, coming alive with in its personal moments and rousing scenes of protest, and grinding to a halt as it rushes through the demonstrations to take us back to yet another meeting. It's hard, though, not to be drawn in by the magnetic characters created by Biscayart and Valois, who give us one of the most heartbreaking portrayals of love torn apart by the ravages of AIDS since Angels in America. Unfortunately, the rest of the film never quite captures that same sense of weight and thematic substance. 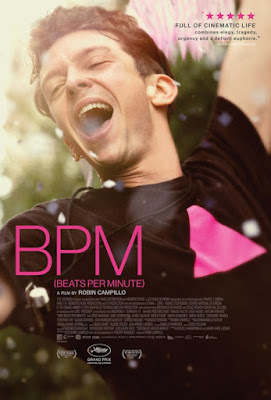 BPM could have used a little bit more of Act Up's uncompromising spirit to keep it from becoming too bland. As it stands, it's a film that plays it way too safe with subject matter that is still far too raw to be relegated to scenes of endless committee meetings. Its heart is in the right place, but its energy never really manages to match the pain and the power of its own central performances.